The Field Components SMA 2 Hole Right Angle Female RG400 Cable Assemblies have an impedance of 50ohm. The SMA Female Right Angle 2Hole Flange to N Female Reverse Polarity Bulkhead Cable is constructed using Fluorinated Ethylene Propylene (FEP) per MIL-C-17 RG400. 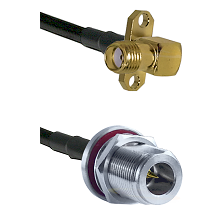 The connectors for RSMAF2-RG400-RPNFBH-Length SMA 2 Hole Right Angle Female RG400 Cable Assemblies 50ohm are precision manufactured for the RF and Microwave cables. 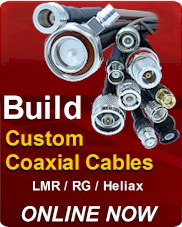 There are 200,000+ SMA RG-400 M17/128 Cable Assemblies available to order online. 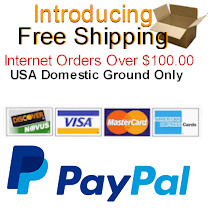 RF and Microwave cables like the SMA 2 Hole Right Angle Female on RG400 to N Reverse Polarity Female Bulkhead Cable Assembly products from Field Components can ship the worldwide. Field Components can also custom manufacture SMA Female Right Angle 2Hole Flange coaxial cables and adapter that ship quickly for all your RF connectivity requirements. 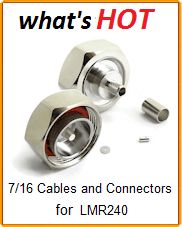 Connector plating options, upon request, are available for custom built RSMAF2-RG400-RPNFBH-Length. Along with our RSMAF2-RG400-RPNFBH-Length SMA 2 Hole Right Angle Female RG400 Cable Assemblies Field Components stocks additional high frequency precision grade adapters, RF connectors and test grade RF Cable jumpers for wireless telecommunications applications, including WiFi, PCS, radio, computer networks, test instruments, Distribution Antenna Systems (DAS) and antenna devices.